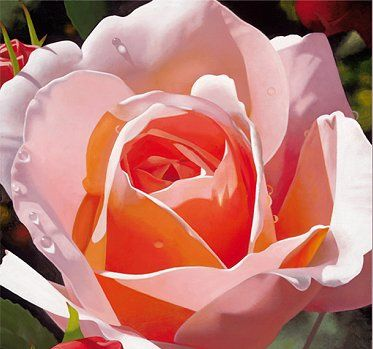 Brian Davis Hand Signed and Numbered Limited Edition Giclee on Canvas:"Morning Rose"
Edition: Giclee Canvas, Artist Signed and Numbered to 50. COA. About the Artist: Brian Davis' striking floral renderings are both contemporary and timeless. The depth in Davis' highly collected art is derived from his careful attention to the subtle shifts in value--relative dark and light. "The light is the real subject of my work," Davis says. "The flower is the stage, and the light is the dancer." Davis' patrons often ask whether there is a light box behind the canvas that is creating the light in the painting, or they assume it is the gallery lighting that illuminates it. However, when the work is taken off the wall and removed from any type of artificial light source, collectors marvel at the natural light Davis has so expertly captured in his paintings. Davis spends extensive time researching and scouting for flowers or scenes that catch his eye. He carries a camera everywhere so he can shoot a subject at any moment. Because flowers will so quickly, and if can take him weeks to complete a painting, Davis has found a way to create a floral image from a series of different shots of each flower. He purposely paints in a larger-than-life-size format for the sheer visceral impact it gives his works. The Argentina Street Scenes series were paintings started, in Buenas Aries. Leandro started creating these about five years ago, intrigued by the hustle and bustle of life in Buenos Aries. He wants the pieces to feel natural and not forced. The location is the inspiration and foundation for the paintings. He layers in the details which convey the energy and feel of that moment in time. The artist now lives in Los Angeles, California where he has shifted his artistic vision to portray the LA Street Scene series. As the traffic and people converge on the city of Los Angeles, Leandro stops during his journey to capture a moment in time. He photographs the urban landscape, takes notes and sketches the specific location where he is. He wants to remember the activity, the energy, and the colors that have made a such a deep impression on his mind. Later he will translate this vitality and intensity onto canvas.